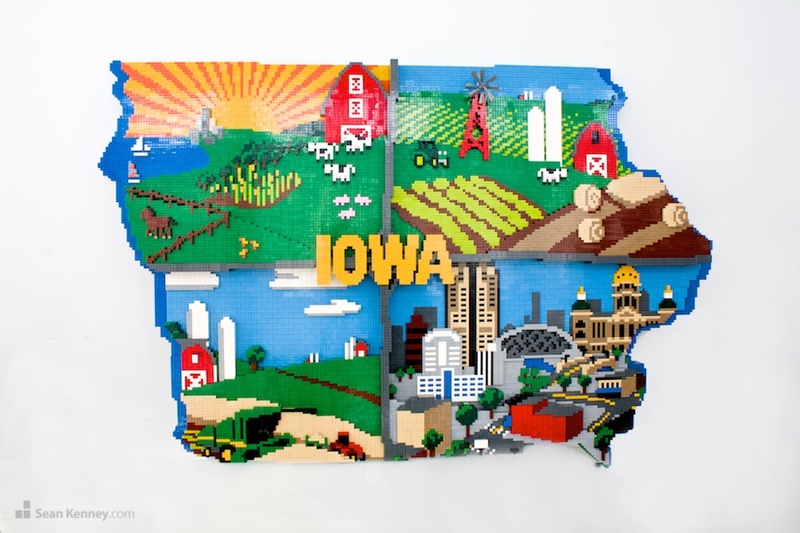 This map of Iowa depicts four quadrants of the state and typical farming and urban scenes. The sculpture is 6 feet long and was displayed at the 2013 Iowa State Fair. The Mississippi and Missouri rivers, which form the left and right borders of the state, are notched out as a sunken blue perimeter. Two major interstates divide the state into the four quadrants, crossing at a cloverleaf under raised "IOWA" block lettering. The city of Des Moines, Iowa is depicted in the lower right quadrant. The windmill is my favorite detail. The sculpture contains 29,196 pieces and took 9 weeks to design, build, and glue. 72" x 50" x 6"